News that the US and China agreed to drop their tariff threats while they work on a larger trade agreement rallied equity markets last night. The NIKKEI was up 0.3%, the SCI gained 0.6%, Eurozone shares were unch to +0.7%, and S&P futures were +0.6%, with firmer oil aiding the move (WTI from $71.38 - $71.85 supply concerns from Iran and Venezuela). Carney’s speech, and lack of optimism ahead of the next round of Brexit negotiations), helped lift the greenback. Gold came off sharply, falling from its $1292.15 high through support at $1285-87 ($1287 – double bottom - 12/28 and 5/16 lows, $1286 – 5/18 1ow, $1285 – 5/17 low, $1285 - up trendline from 12/15/16 $1123 low), to reach $1282 – where support in front of the $1281 (12/27 low) held. 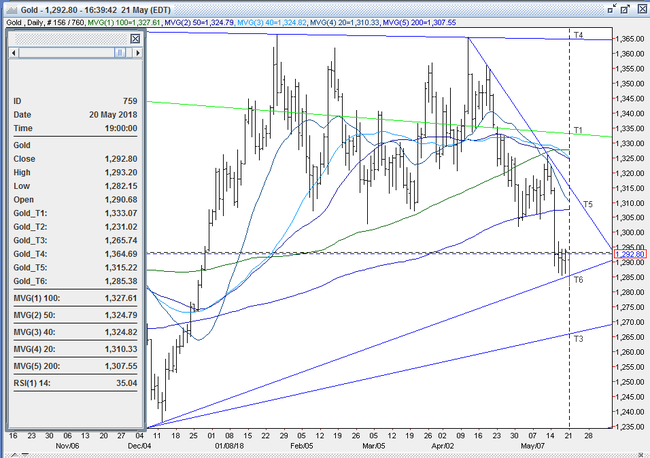 Later during European hours, the DX pulled back to 93.78, and gold bounced back to the old support at $1285. After the NY open, the DX continued to pare more of its overnight gains – despite a stronger than expected reading on the Chicago Fed National Activity Index (0.34 vs. exp. 0.14). A strong bounce in the euro ($1.1770) knocked the DX back to 93.65, and tripped some bargain hunting buying and short covering in gold. The yellow metal punched back through $1285 to reach $1289.50 by mid-morning. During the late morning, US equities cut some of their gains (S&P +11 to 2725), while the US 10-year bond yield dipped to 3.058%. 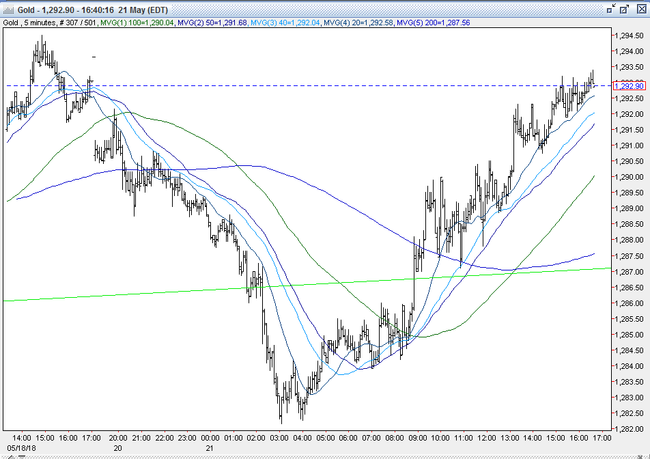 The DX, after a modest bounce to 93.87, dipped back to 93.66. Gold clawed higher, and reached $1290.30. Into the afternoon, US stocks turned back higher (S&P +23 o 2736, industrials lead gainers), and the 10-year yield bounced up to 3.076%. However, the DX ticked down to 93.64, still under pressure from a rebounding euro ($1.1779), and a bounce in the yen (111). Gold probed higher, and traded up to $1293. It was $1292 bid at 4PM with a loss of $1. Open interest was up 0.2k contracts, showing a small net of new longs from Friday’s advance. Volume was lower but still healthy with 299k contracts trading. Bulls, though disappointed with today’s early decline, should be pleased that gold was able to rally back and close above the key uptrend line at $1285, and only off $1. They cite the more favorable positioning from Friday’s COT report, showing a relatively and historically smaller Net Fund Long Position, along with an increasing amount of gross shorts that leave the market set up better to move higher. They maintain that gold’s $83 drop (6.08%) since its $1365 4/11 high, and $44 decline (3.32%) since its $1326 top from 5/10 leave it badly oversold (14-day RSI = 34.4), and expect a significant bounce. Bulls are looking for a quick rebound to the $1324-27 area - the 50% retracement of the down move from the $1365 high from 4/11 to today’s $1285 low, and the 100-day moving average. Bears cheered the initial news on the US-China trade talks, and the resulting rally in the dollar past 94 that knocked gold under $1285. However, they’re concerned that the dollar couldn’t hold its gains – despite the strong advance in stocks, and a 10-year yield that is solidly holding north of 3% - and that gold had an outsized bounce back over $1285. Bears will look for continued dollar strength to put further pressure on gold, and will look for a retest of $1285 followed by $1281 (12/27 low) to bring $1275 (options) and $1273 (double bottom, 12/25 and 12/26 lows) into play. All markets will continue to focus on the volatility in the equity and bond markets, geopolitical events, developments with the Trump Administration, corporate earnings, oil prices, and will turn to reports tomorrow on UK CPI and PPI, the Richmond Fed Manufacturing Index ,and comments from the BoE’s Carney for near-term guidance.